Happy Easter! Christ is risen; He is risen indeed! Yesterday was a beautiful day. I was thankful to spend the first half of the day with a group of my biking friends doing a super hard ride. I don’t know why it felt so much harder than previous rides, but I felt like I got a great workout… at least, I trust that’s what that leg-burning feeling means. 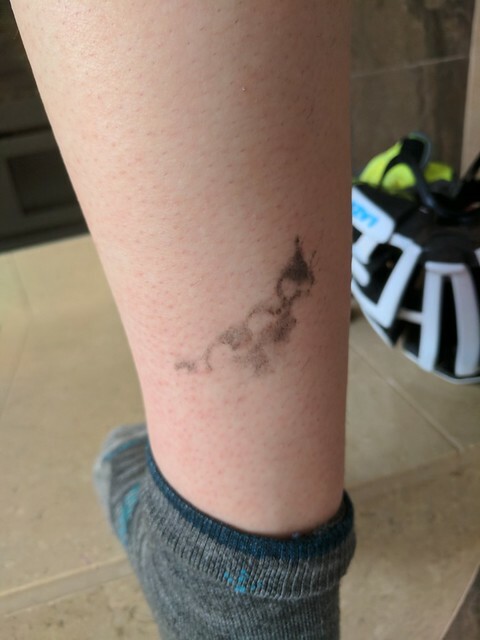 I also accidentally gave myself a chainring tattoo, which didn’t wash off in the shower. I figured would look real great with my skirt at church on Easter. Luckily I had some dark nylons that hid it pretty well, I think. After Benji got up from quiet time, he and I met my friend Ellen and her Norwegian buhund Lakka at Bridle Trails. 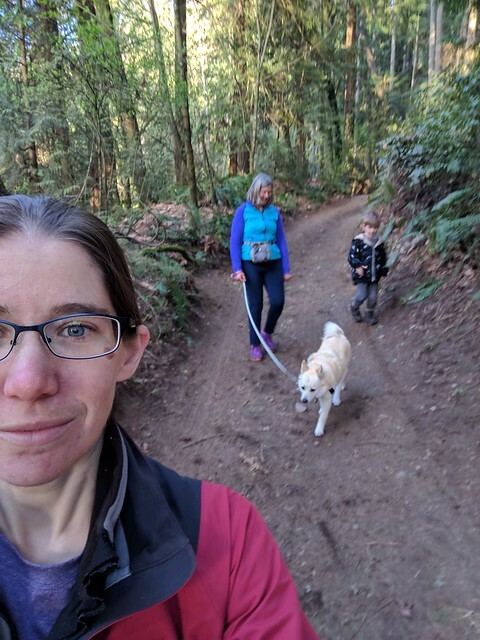 We had one of our nicest Bridle Trails walks to date, having such a good time that we walked all the way from one end of the park to the other, a good two hours in the woods. The extra daylight has really helped out with this activity. On the walk, we saw our first trillum of the season… and then lots more! 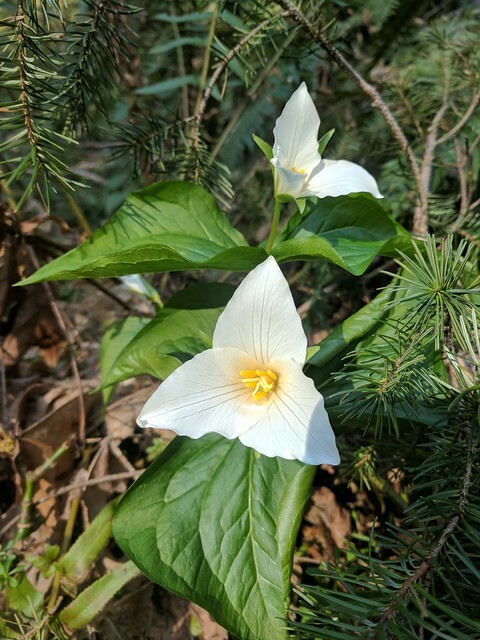 I love trillium; they are so delightfully Washington. We also helped Lakka practice lots of tricks, and Benji practiced doing those tricks, too. He’s decided he wants to be a dog, which I’m okay with because he’s far more obedient as a dog than as a kid. 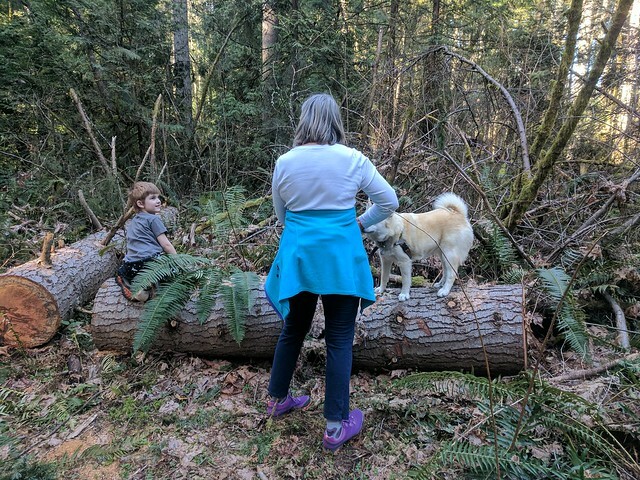 This was Lakka and Benji practicing “all the way up,” the command to get up on a log. 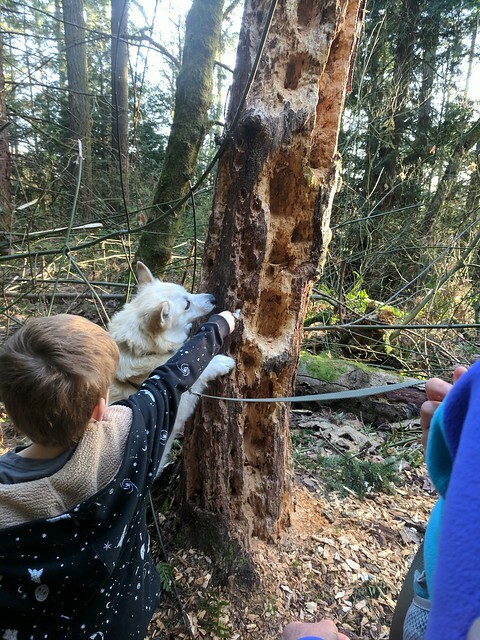 Benji hid a piece of cheese in a woodpecker hole and told Lakka, “find it!” Which she did, with alacrity. All in all, an excellent, if exhausting, day. Sunday proved no less tiring, but also nice enough. Benji and I started the day with “empty tombs” — donuts with donut holes on top. You remove the donut hole and voila! There’s nothing inside, just like when Jesus rose from the dead! 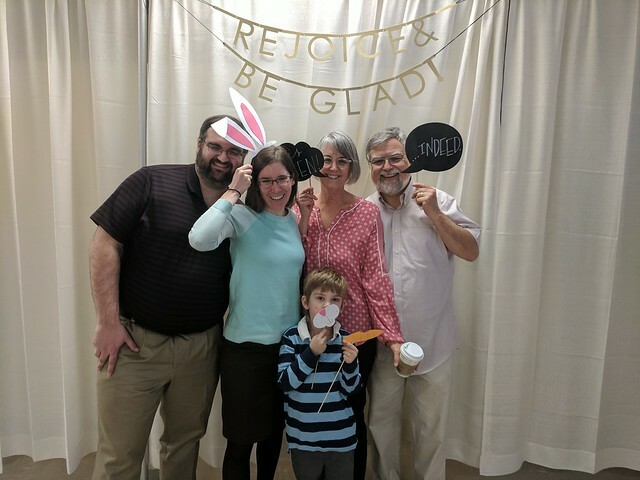 Here’s our family looking real classy at the photo booth after church. 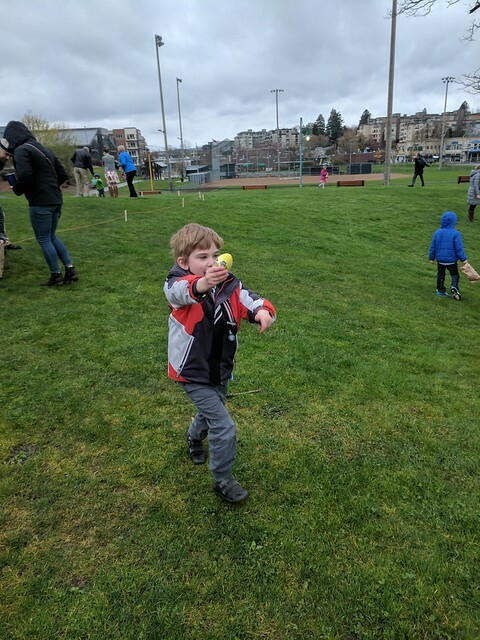 And, despite cold temperatures and spitting rain, Benji participated in the church Easter egg hunt, where he got a super-extra-bonus egg. Thank goodness most of the eggs didn’t have candy. After quiet time, we went over to my parents’ house for an Easter dinner with Ian’s parents and grandparents. It was nice. Benji even ate some stuff. 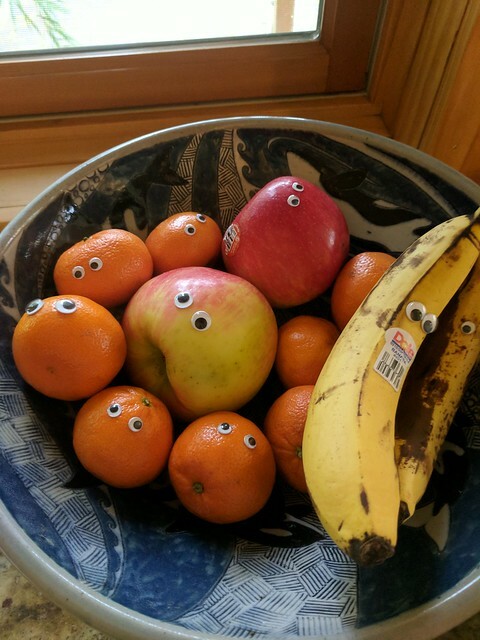 …and then I was able to do it to mom and dad’s fruit without them noticing (at least, until someone pointed it out). Yesterday we got together with my friend Ellen. One of the (many) things I like about Ellen is that she always pushes our boundaries with her suggestions for what to do. She’s the one who took me cross-country skiing before Benji was born, and left me practically unable to walk for like a week (the blog post title: “A Litany of Aches.” Ah, good times). 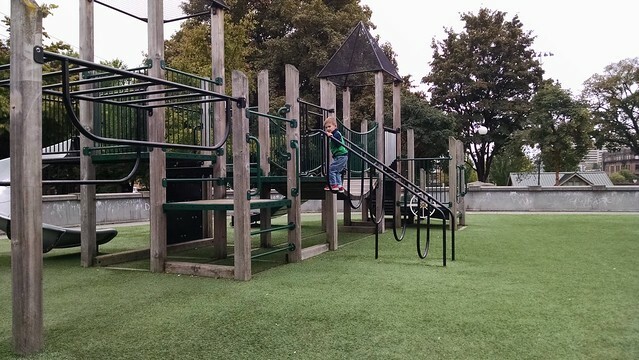 She invites me and Benji to parks in the city of Seattle that we otherwise never would go to. She encourages me to eat odd things and try tea I wouldn’t normally have. It’s good to have this kind of friend. Yesterday was no exception. 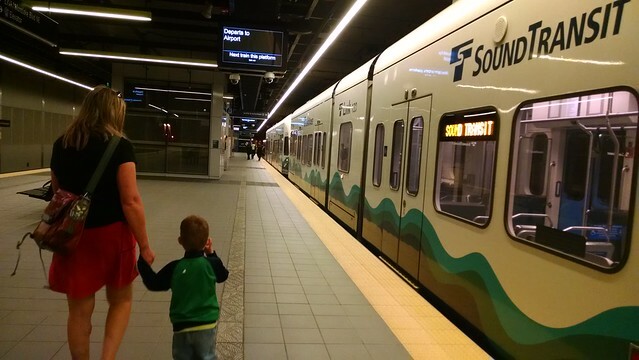 She suggested that we take a light rail train from the new UW station, which I was keen to visit but hadn’t actually expected to actually use so soon. At first, hearing the suggestion, I thought in my head: That’s too big of a trip. Maybe we should just go to a park. But then I thought, No, every time we do an adventure with Ellen it’s really fun, even if it’s also a bit of a stretch. We’ll give it a shot. 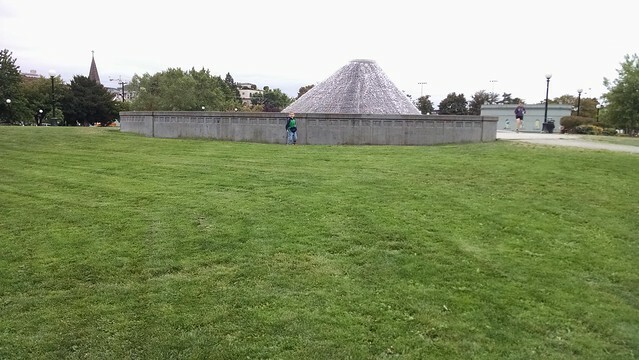 We picked Ellen up at her house and drove to the Center for Urban Horticulture. There we paused to eat a snack and let Benji examine every single map board. He was excited to find the “You are here” marked with a little pine cone, which Ellen called her “little pine cone friend” and pretended to put it in her pocket. 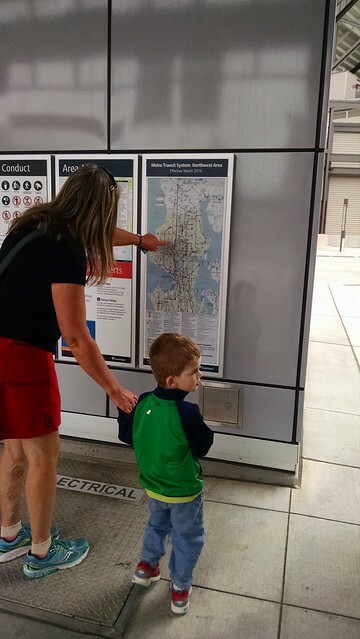 The rest of the walk to the light rail station, we looked for maps and found a surprising number — more than I would’ve expected, and more than Ellen had ever noticed before. Benji found a red dot “You are here” and pretended to put that in his pocket. The walk took quite a while. 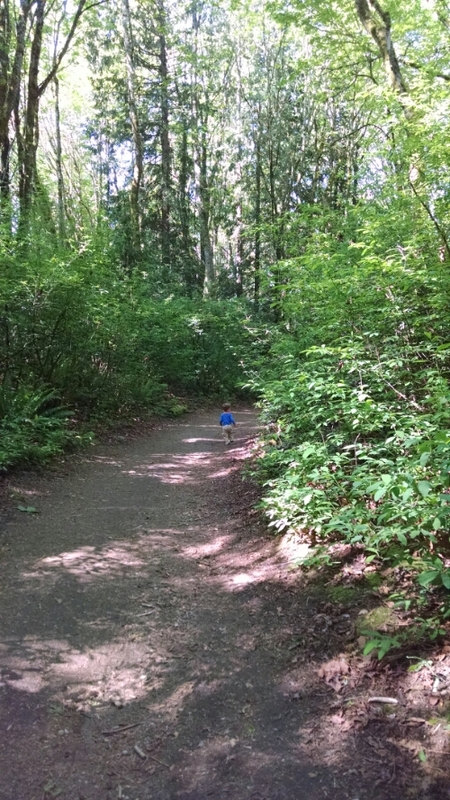 It’s not far, just a little over a mile through the Union Bay Natural Area and skirting around the UW sports facilities. Not far, that is, if you have grown-up legs and interests. But in addition to scrutinizing every map, we admired a large, rapidly scuttling beetle; picked up a small, slow-moving green cricket and relocated it to some friendly leaf/grass habitat; peeked over a bridge at some incredibly horrid oily slough water; sat in the dirt and generally dragged our feet; tried to go into Lake Washington at the UW boathouse; and, of course, continually asked when we’d get to the light rail station. 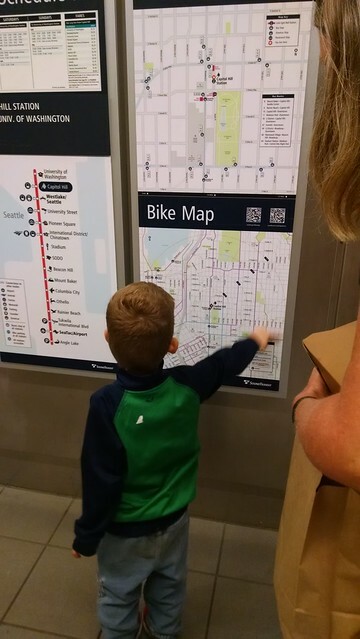 Eventually we made it, however, and Benji was excited to find even more maps at the light rail station. The escalators were surprisingly scary. In the past, Benji has wanted to ride escalators endlessly. But this time, he balked and only went down while holding both our hands — maybe because they were really long and going down into the dark? I’m not sure. 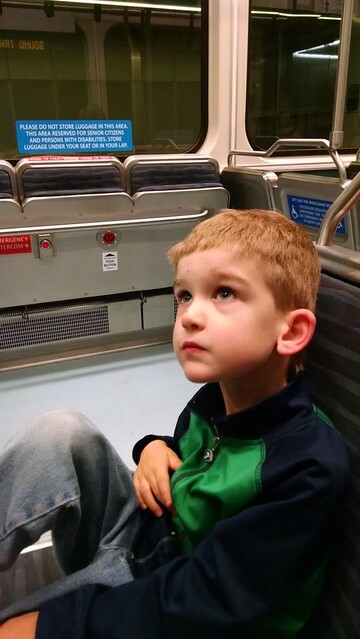 In any case, we made it down to the trains, where we totally forgot about all escalator fears. Our ride was really short — we got off at the next stop. 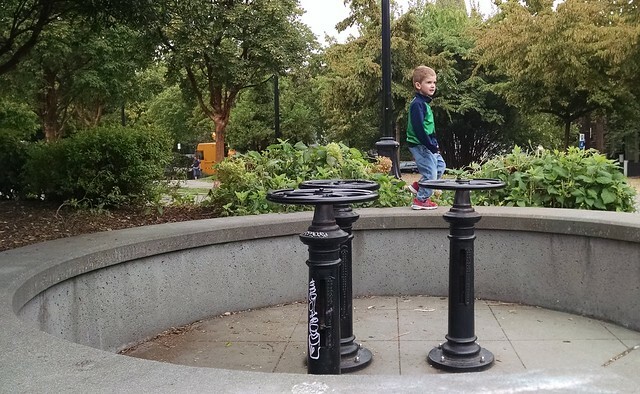 Handily, this was near Cal Anderson Park, a park Benji’s never been to, and which has one of the more interesting fountains around. My picture doesn’t really do it justice, because when we got closer I spent a lot more time keeping Benji out of the water. No time to pull out a phone! Ellen squeezed up with much more difficulty. The entrance wasn’t made for grown-ups! Other things were fun to play with there, too. By about 11:30, we were SO ready to eat! After what Benji would probably liken to the Walk of a Thousand Tears, we made it to Ellen’s favorite bakery. They had one of the fanciest little pastry thingies (they called it a croissant, but I have to disagree; it was layered like a croissant, but that’s where the resemblance ends) and not only did they look pretty, they tasted delicious. 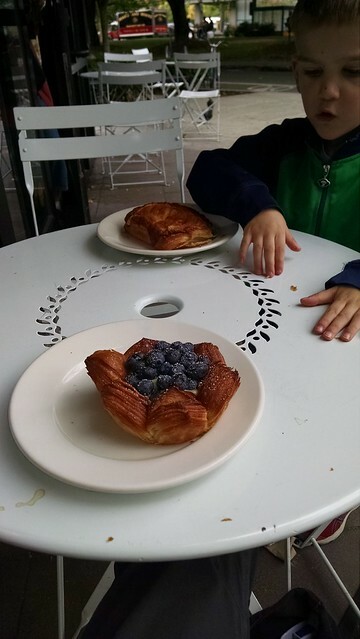 Look at Benji’s face: “oooooo!” He was saying, “I’m going to try some of YOURS, Mommy!” But in the end, he didn’t like the crunchy part, so I got to eat both my blueberry lemon pastry, and his ham and cheese croissant. When I looked at the clock and it was 12:30, I realized we wouldn’t be getting back home for our usual nap time. That was OK; we finished up, walked (increasingly slowly, feeling rather tired) back to the light rail station, and took the train back. Benji was getting quite tired, so I carried him on my back for some of the walk back from the UW to the car. On the way back to Ellen’s house, Benji and Ellen joked about putting their “little friends” down for nap. After we dropped her off at her house, Benji about fell asleep on the drive home. I kept him awake long enough to put him down for nap in his room, when he conked out solidly, and we had to wake him up. Needless to say, Benji and I both slept extra-well last night. Another fun, successful adventure with Ellen! Go to Nana’s house and see Builder Pat at work. Eat lots of raspberries. 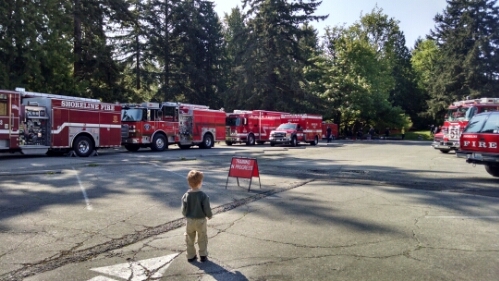 Go to St. Edwards State Park and find a half-dozen fire trucks from various agencies doing training. 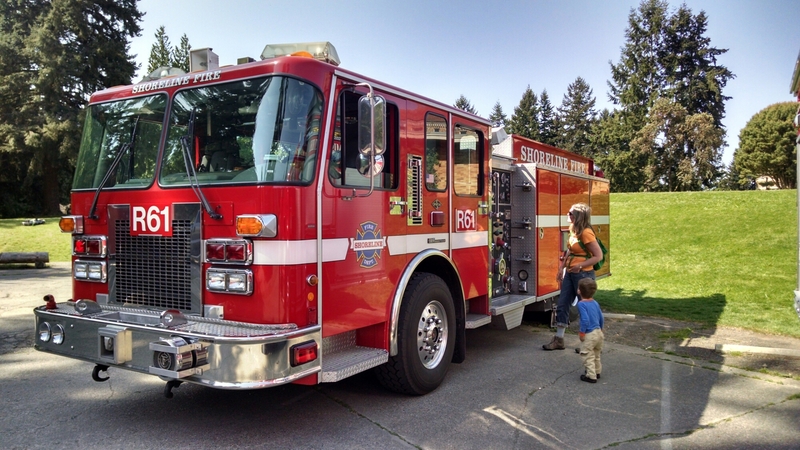 Get permission to closely examine the trucks while the firefighters are training. Conduct said examination with Miss Ellen. 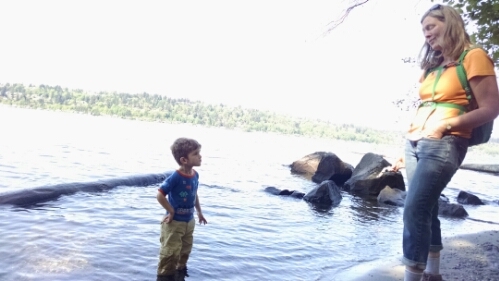 – Hike to the lake like a big boy, walking the entire way there and most of the way back. 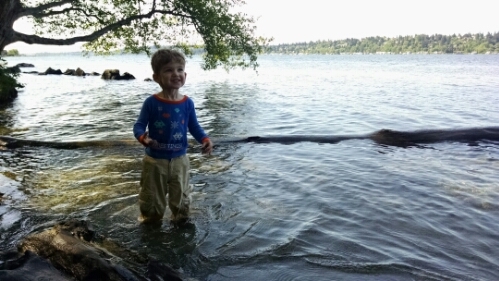 While at the lake, learn what I mean when I say, “Watch out or your feet will get wet.” But, simultaneously, do an excellent job obeying when I ask not to go deeper. 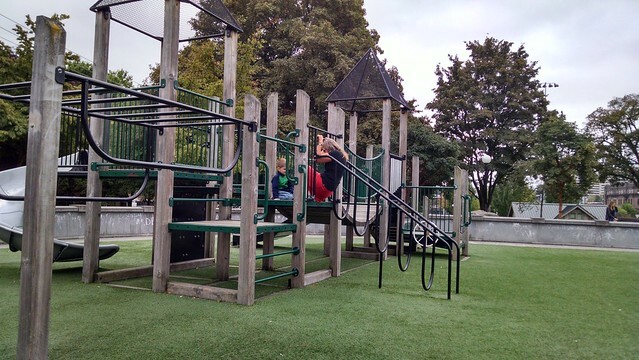 – After hiking to the top up from the lake, go play in the and box at the play area. Pour sand down front of the diaper. Then receive an arrow popper from Miss Ellen. – Go home and eat lunch, then go for a diaper change and reveal a huge gooey poop coated with sand, and sand coating everywhere. Rinse off in tub before nap. I put shoes, socks, and pants out to dry on porch with no hope that they’ll ever be not wet again. The shoes are utterly soaked. – Feel too darn excited to nap, even with two hours in a dark crib. 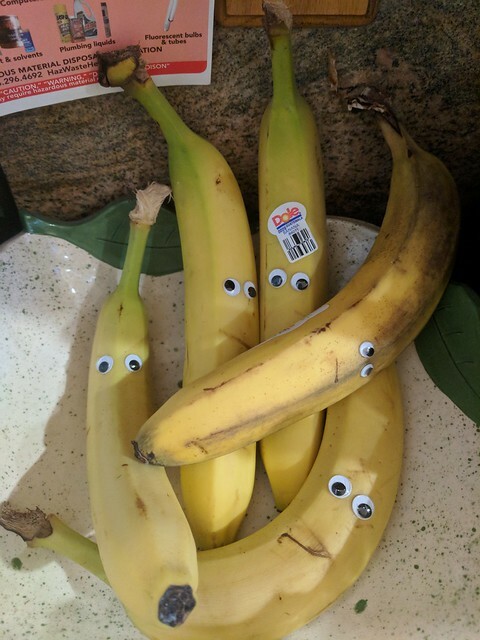 We’ve lived in our house for over 3 years. 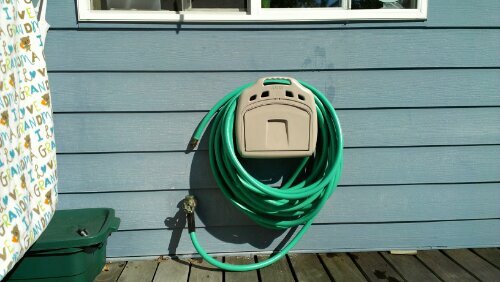 A hose hanger has languished on our back porch for a year. Now, finally, I have a home for our back yard house. Seems small, but it’s sure nice to have it off the porch! 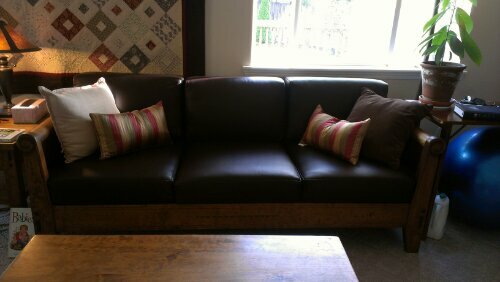 Back in April, we paid money to a upholstery place to make new cushions for our old, sagging couch (which, I will say, came to us free). At the of July, the guys came and took our couch. And finally, last week, it came home. Hooray! Amazing how comfy and improved it is. 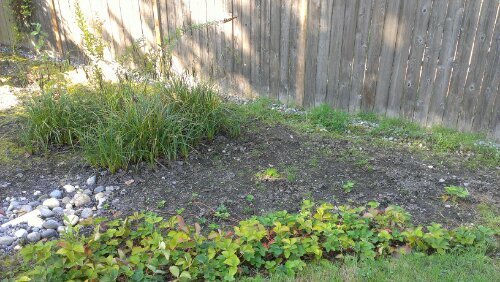 Weeded the rain garden this weekend. 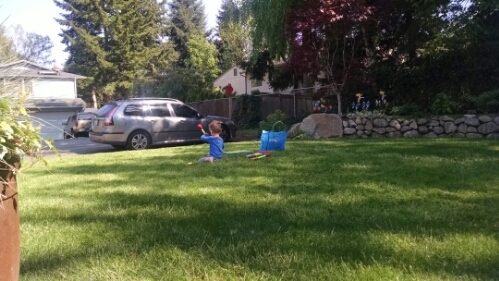 So many weeds, so little motivation. 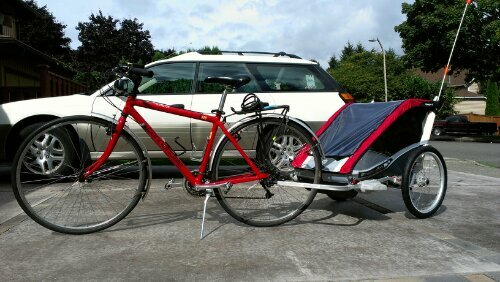 Speaking of motivation, Benji and I went for our inaugural bike ride yesterday accompanied by my friend Ellen. I cannot overstate my excitement at being able to go on close errands by bike rather than car. Yesterday Benji did great: he hated the helmet, but I heard happy noises from the trailer once we got going. He did start trying to get the helmet off when he got bored, but we made it for 45 minutes with just one crawl-around break. I need to get a pinwheel for Benji in the trailer, and we’ll be all set. It’s best to stay in touch with both sides of an issue. A person who fears God deals responsibly with all of reality, not just a piece of it. Really long, difficult night Friday night/Saturday morning. We both ended up sleeping until later than usual, and still moved through most of the day as zombies. This later-than-usual sleeping meant that when we woke up, we actually had to get rolling, because we had a play to get to at 2:00 pm. We packaged Benji, who finally fell asleep a mere hour earlier, into his carseat, gathered up the requisite huge pile of stuff necessary for traveling with babies, and somehow got out the door mostly on time. Traffic was horrendous, but we made it to my friend Ellen’s house close to on time. She and her family looked after Benji for us for the afternoon while Ian and I went to our play. We saw Gaudy Night, at Taproot Theater, and really enjoyed it despite having nearly the worst seats in the house. Incredibly, that took the entire day. We were exhausted by the time we got him back down at 10 pm. Saturday night/Sunday morning involved an unnecessary amount of wakefulness, due to the fact that Benji slept for 6.5 hours earlier in the day. It’s great that he can sleep that long. now we need to work on moving his sleep time back towards night, rather than midafternoon and early evening. 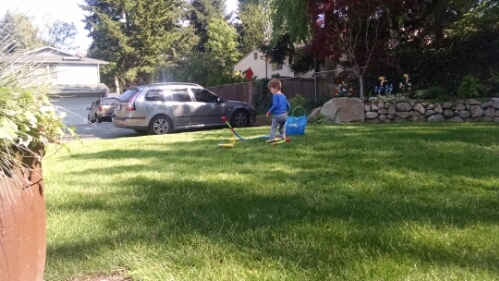 Anyway, Sunday was a slow start day, too, but the weather was gorgeous so Ian and I arranged for Mom and Dad to come watch Benji while I went out for a bike ride and Ian did some errands and had time to himself. 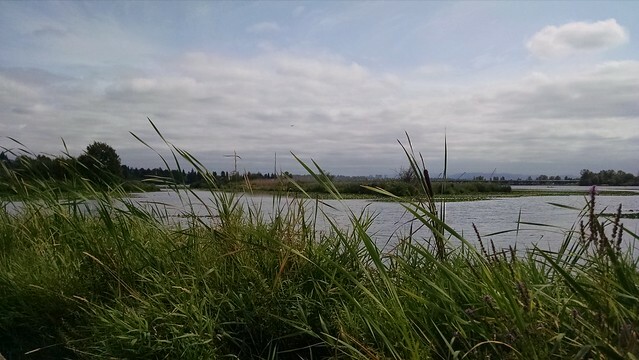 I got in a really lovely unexpectedly sunny 52-mile loop, out to Snoqualmie Valley. When I got home, Ian was reading a book and Mom and Dad remained on baby duty, which they kept up for several more hours. It was a wonderful gift. They left, we had a crazy very brief hailstorm, and shortly thereafter I drove down to Renton for my Team Group Health annual meeting. 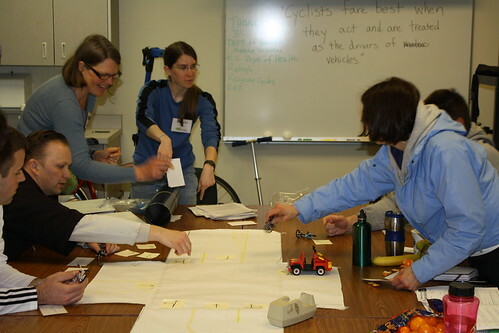 It was lovely getting to see and socialize fun bike ladies I haven’t seen in months. I’m already glad I rejoined, and I’m really looking forward to the team rides, which start next Saturday. Racing, well, I’m less excited but I’ll burn that bridge when I get there. Author KatiePosted on October 22, 2012 August 31, 2016 Categories FamilyTags baby, Benji, Ellen AagaardLeave a comment on Busy Bees! The following afternoon, however, found me horizontal on the couch, unable to painlessly move anything below my neck. Sitting up was a trial, as it involves legs and back. Typing — holding my arms out — forget about it. Much better to just lay on the couch and occasionally groan. In fact, it’s only today that I’ve had the oomph to stay upright long enough to blag. No, I didn’t get in a bike crash; and, in fact, I’ve had crashes that left me feeling less battered than I did on Friday evening. Nope. I went skiing with my friend Ellen. 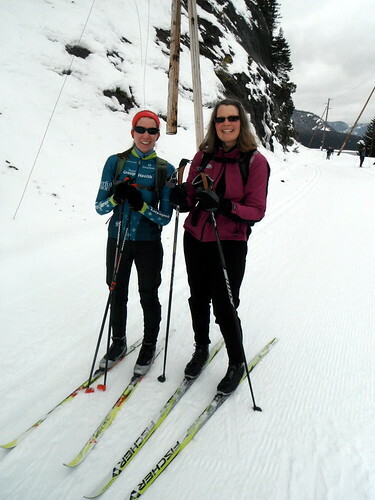 Although I know Ellen from the bike world — we’ve taught a number of classes together — she is an avid winter sport person. She loves skiing, snowshoeing, anything that involves snow. For our get-together this month, we decided to play to her strengths and head up to the snow. I’ve never skied before, but figured Ellen could teach me. Her family has kids of a variety of ages and sizes, and handily I was able to borrow her daughter’s skis and boots (her daughter, by the way, is going into middle school). Should be an adventure, right? We optimistically set off from her house at 7:30 am and reached Cabin Creek, up in Snoqualmie Pass, about an hour and fifteen minutes later. We went by Hyak and she said, “We could ski there, but it’s really boring because it’s totally flat. Let’s go to Cabin Creek, where there’s terrain.” I agreed. Little did I know what “terrain” would mean for me, skiing noob that I am. Here is a picture of Ellen. Doesn’t she look nice, happy, and innocuous? A totally misleading image, as it turns out. 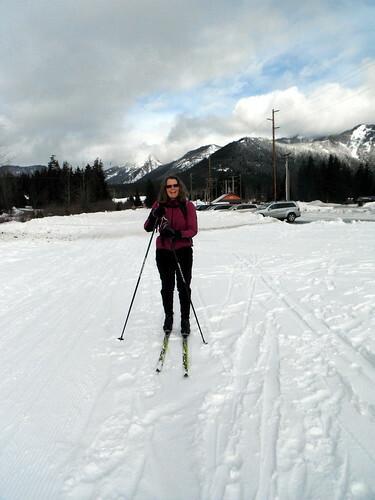 Here’s me, partway through our ski adventure, at Hyak. By the time we took this picture, I’d spent a couple hours slipping, sliding, and — most of all — falling on the “terrain” at Cabin Creek. Despite my big smile, I was already getting some inkling that this was going to be a deeply painful experience, and that the pain wouldn’t go away after we got off the skis. We started out and I skied for about 3 seconds… and then fell on the first gentle slope. I laughed, got up, and started again. And did it again, and again, and again. I couldn’t keep the skis parallel very well, and those inner-thigh muscles soon began indignantly letting me know that I don’t usually use them, and what was I thinking? Although Ellen did her best to teach me, I never really figured out how to turn, go up hill, go downhill, or stop. That, however, didn’t stop us from going up and down hills, around corners, etc., because that’s what “terrain” involves. At one point, though, I was skiing along by myself, with Ellen off the front making it look easy, and I had a moment of easy grace that felt like flying. It was beautiful, exhilarating, elegant, joyful, fun. In that moment, I understood why people would choose to ski. Then I fell down and that was the end of my epiphany moment. After about a mile and a half, Ellen asked if I wanted to go into the woods. Sure, I guess, it can’t be worse than what I’m doing now, right? WRONG. The woods were an intermediate skiing course, and it quickly became abundantly clear that there was no way I’d make it. I fell, and fell, and fell — this time on steeper slopes that were harder to recover from. It was really (a) embarrassing, and (b) painful. At this point, Ellen decided that maybe terrain wasn’t such a great idea for somebody who’d never skied before, and maybe we should try something a little more boring after all. We decamped to Hyak, which was populated almost entirely by retirees and parents with toddlers on skis (who, by the way, still skied better than I did). So by the time we took the picture of me at Hyak, I’d had my feet slip out from under me pretty much every way you can imagine. In fact, a few times I was astonished that my legs could get into that tangled of a mess. My inner thigh muscles — whatever they’re called — were really hurting by then, from unaccustomed use as well as all those times I ended up doing some ungraceful version of the splits. My ankles and knees were battered and bruised (still are!). My arms and shoulders started getting tired, too, because in addition to falling on them a bunch, I kept catching myself with the ski poles and, frankly, I have a cyclist’s upper body (which is to say, nothing). Hyak went better, as it was perfectly flat and I skied in the tracks, which requires almost no skiing ability whatsoever — just right for me. I only fell a couple times. Here’s us partway through Hyak. Ellen was right, though; I’d never skied before, and I still found Hyak boring on the way back. Boring, but not painless. 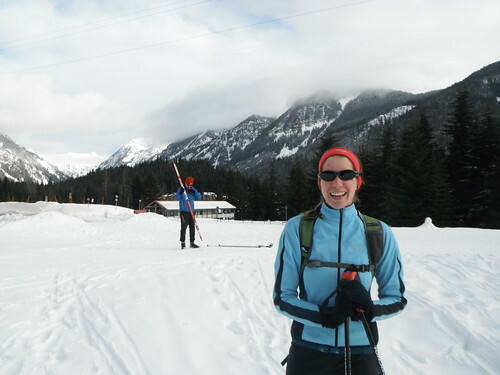 I could feel my legs getting really fatigued, and it got increasingly difficult to control those already-unruly skis. My ankles also really, really hurt where to tops of the boots were, like maybe I’d put the boots on wrong… or maybe just all the falling bruised my ankles badly and I was just starting to feel it. In any case, we got back to the parking lot, and I took the skis off… and the car was like a million miles away. It looked like a tiny speck, a car you’d see from an airplane during takeoff. I gritted my teeth and walked, every step misery on my ankles. Somehow the distance dilated to be much shorter than it looked originally, so we got to the car without my collapsing in a puddle of exhaustion (and slush). Putting on my regular shoes, which don’t reach my ankles, was heaven. The drive back to Ellen’s house, and then my drive home, were exercises in stiffening up. 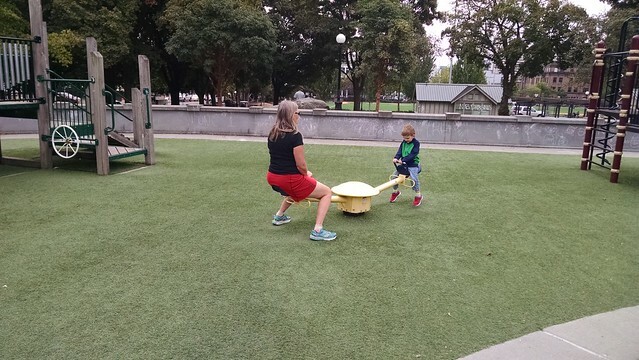 By the time I arrived back home, I could hardly pick my legs up, couldn’t lift my left arm or touch my left ankle (and my right arm and ankle were only a little better), and both my knees had swollen up and were covered with bruises. Verdict: Hot soaky bath required. That didn’t really help, though, as we had no hot water. I dragged my carcass to the couch and hardly moved until Ian levered me out to get into bed. All Friday night, changing position proved to be an exercise in minimizing agony. It was awful. I cannot even express how much pain I was dealing with. It wasn’t unbearable, but it was really, really bad. It was more than just muscle pain; I know what hard exercise does to muscles, and I’m familiar with that feeling. This was worse. I think I must have pulled a few things in all the falling. Fortunately, I’m young and resilient. I went for my team bike ride on Saturday morning and confirmed that biking muscles and skiing muscles have very little overlap. My legs did feel fatigued, though. Skiing was hard work. When I got off the bike, the pain all came back. I hobbled around groaning the rest of the day. Sunday was the same, but noticeably less so. Today, on Day 3 After, I’m still sore, but I have almost full ranges of movement back. Now that’s what I call a good time. Oh my, yes. Because as a cyclist, I understand that pain and fun aren’t incompatible. I’m not sure I want to ski again any time soon, but it was really good to do something I’ve never done before and that I’m really terrible at. It was humbling. And everybody can use a good humbling experience now and again. I know that there is nothing better for them than to rejoice and to do good in one’s lifetime; moreover, that every man who eats and drinks sees good in all his labor — it is the gift of God. 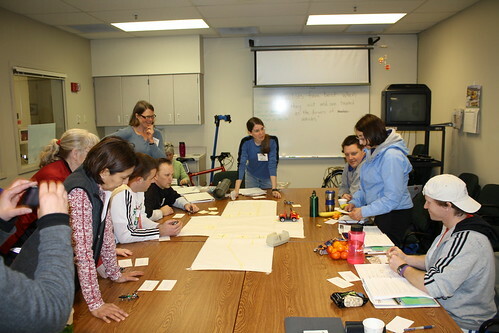 How do you teach PE teachers — or anybody — traffic principles without resorting to excruciating PowerPoint slides full of confusing pictures? Since I don’t teach it with too many words, here’s the visual explanation. Remember the practice intersection I made? Here is it in action (yes, that’s me with the idiotic expression on my face in every single one of the pictures). Combined with some little bikes, a Playmobil car, and some imaginary bike scenarios, we have a pretty effective way of letting people explore traffic principles themselves. Overall, the Auburn class went pretty well. Click below the fold for more thoughts on the class. On a slightly different note, did you notice my clothing choice in the pictures? 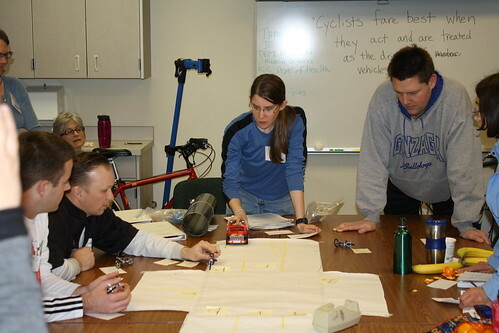 I always wear a long-sleeved bike shirt and jeans to the trainings. Very casual, very practical for all the moving around and bicycling I have to do during the trainings. Today a guy I was talking with told me that he thought what you wore to work reflected your work ethic and indicated the quality of your work. He, by the way, was wearing slacks and a button-down shirt. I was in bike clothes. I said, “So when I wear PJs when I’m working from home, my work isn’t as good?” He replied with a tangential comment about younger people (my age) and their standards of dress. That made me think, though. When I wear PJs while working at home, that’s one thing. But should I dress more professionally for these trainings? The PE teachers typically show up in sweat pants and T-shirts, but since I’m putting on the training, should I have a higher standard? Do the participants, all of whom are 15 or more years older than me, see a young and inexperienced trainer because of my clothing choice? Or, I guess I should say, do I make myself seem even younger or less experienced than I am by my clothing choice? I already struggle with looking youthful thanks in part to the oily, acne-prone skin I inherited from my parents; should I use clothing choice to somewhat counteract that? Something to think about.